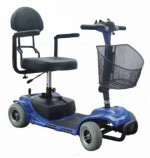 4 Wheel Mobility Scooters are a useful tool for anyone who has limited mobility but able to be mobile when needed. 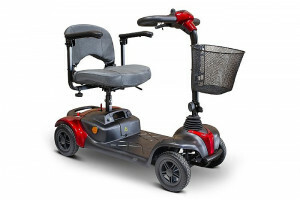 As opposed to a wheelchair, 4 wheel electric mobility scooters are designed to look and feel more like driving a car but offer more stability and comfort than a 3 wheeled scooter. 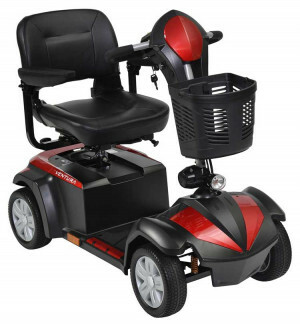 There are many factors to consider before purchasing a 4 wheel electric scooter which you can find detailed information below. Choosing the right 4 wheel scooter for you doesn't need to be complicated, but there are a few factors you'll want to consider when making your choice. 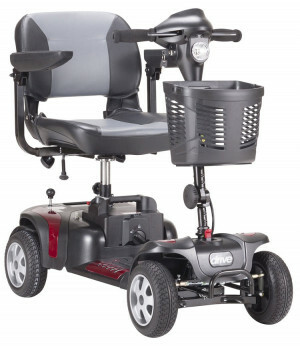 Your total body weight, height, along with the weight of items you will carry are important factors to consider when choosing a mobility scooter to purchase. 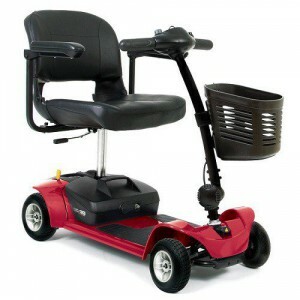 The typical adult scooter has a weight capacity of 250-350 pounds. 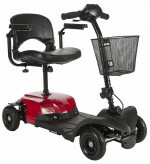 Riders who need a higher weight capacity can invest in a heavy-duty scooter, which can support more weight while maintaining speed. 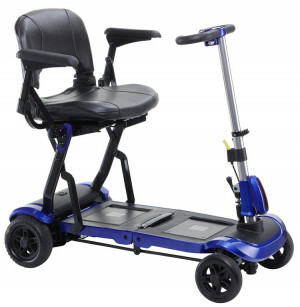 Many bariatric scooters that are designed for lighter weight riders are portable. They can be taken apart and transported easily, making traveling more convenient. The Traveler Scooter has a weight capacity of 250 LBS. It can be disassembled into five pieces and easily reassembled. 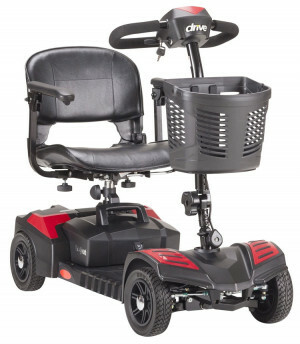 4 Wheel Electric Scooters for adults are better for outdoor use as they can be driven over rougher terrain, including gravel, dirt roads, wet grass, hills and even curbs. 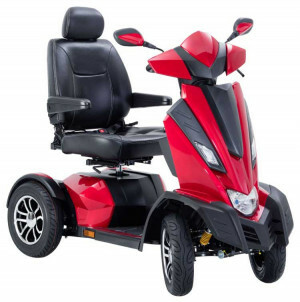 There are some factors that you will want to consider in order to find a 4 wheel mobility scooter for adults that will best meet the navigational needs of the rider. 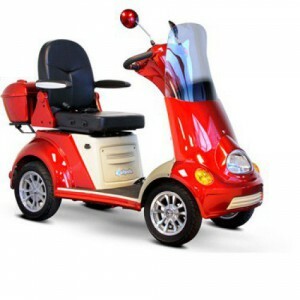 You will want to make sure that the scooter you purchase has high enough ground clearance for areas that the rider regularly visits. 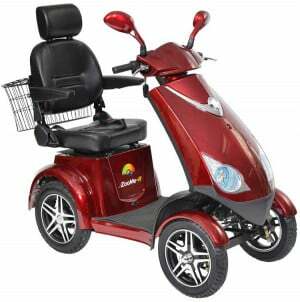 The average full-size scooter has a ground clearance range of 2-4.5 Inches. 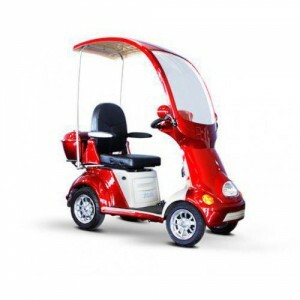 However, people who spend a lot of time outdoors might be interested in scooters like the The Prowler Mobility Scooter that has a 5 inch ground clearance, which makes everything much more accessible, particularly when you aren't sure what type of terrain you'll encounter. The 4-wheel scooter is a safe option because the weight of the rider is evenly distributed over the four wheels of the scooter. 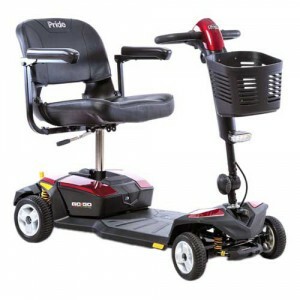 The broad scooter wheelbase makes the risk of tipping over very slim, even while traveling at higher speeds. The four wheels serve similar functions to that of a car. The back two wheels are for pushing the scooter forward and the front two wheels are for steering. 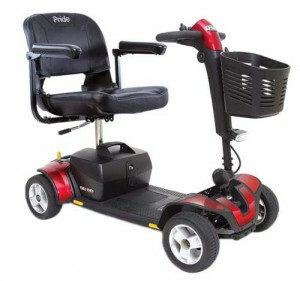 On top of increased stability, you will also find the 4-wheeled scooters are very durable and will keep the rider safe while getting them where they need to go. The average speed for 4- wheel scooters is 5 MPH. 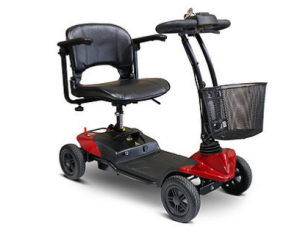 For those looking for a higher traveling speed, the Mobility Scooter EW-54R can reach up to 15 MPH. 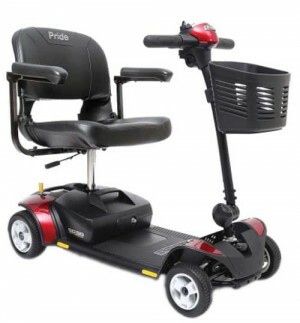 The speed capabilities, and how long it takes to attain that speed, are some things to consider when picking the best four wheel mobility scooter. 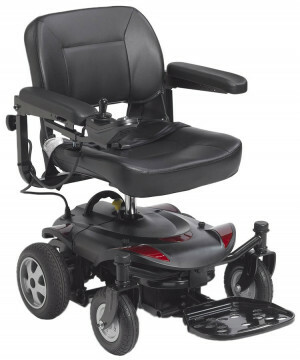 Battery power is also something to consider when purchasing an electric scooter. For someone who enjoys traveling, the number of miles that can be covered per charge will be an important factor. The Breeze is designed for travel and can be disassembled for transport convenience and driven up to 20 miles per charge. One preference to consider is turning radius. Four-wheel scooters do not have the same turning radius capabilities as the 3-wheel scooters. If the rider lives in a home with many tight corners, the 3-wheel scooter may be the better choice. 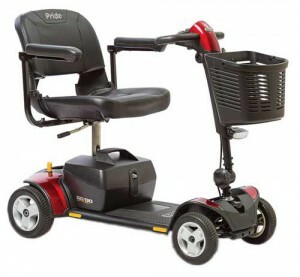 However, the 4-wheel scooter is the superior option for traveling in open areas. 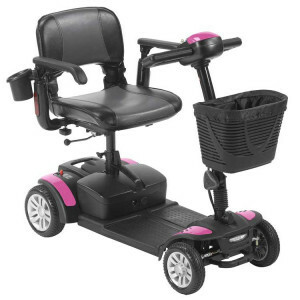 Other preferences to be considered when investing in a mobility scooter are the type of basket, the adjustable armrests, headlights, seating options and color. Baskets come in different sizes and shapes. Armrests might have an adjustable height and be removable. If the rider will be out in the dark, headlights should be made a priority when choosing a scooter. 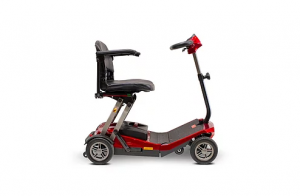 There are a wide variety of options for those looking to buy a mobility scooter. Choose the right options for you to select the scooter that best fits your needs. 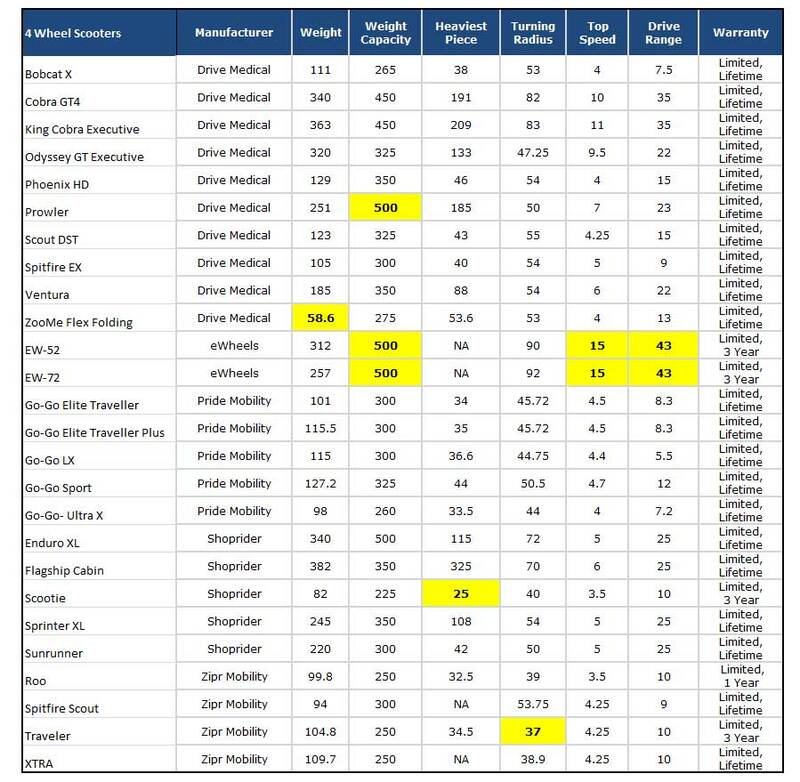 Top leaders are highlighted in yellow.